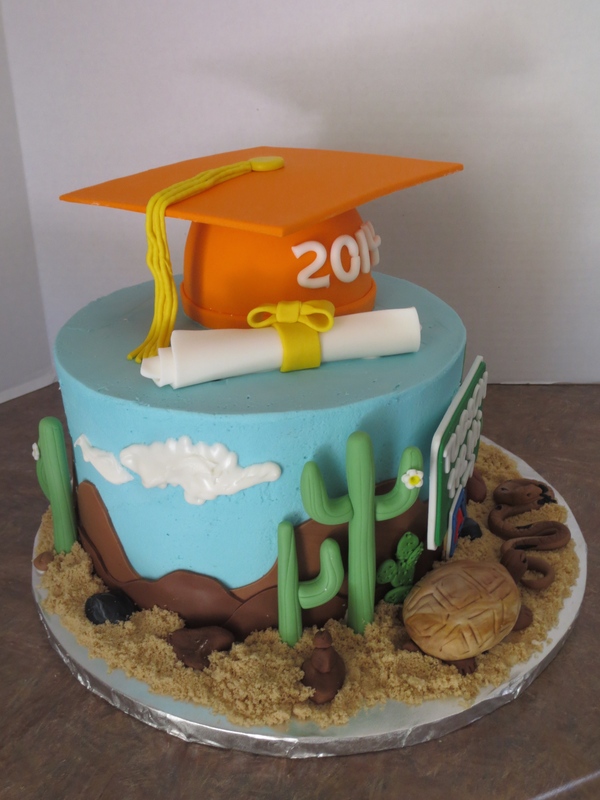 This weekend I made a graduation cake that had a desert theme and lots of desert items. Our friends were hosting a party for their son that graduated from high school and is headed to the University of Arizona in the fall. 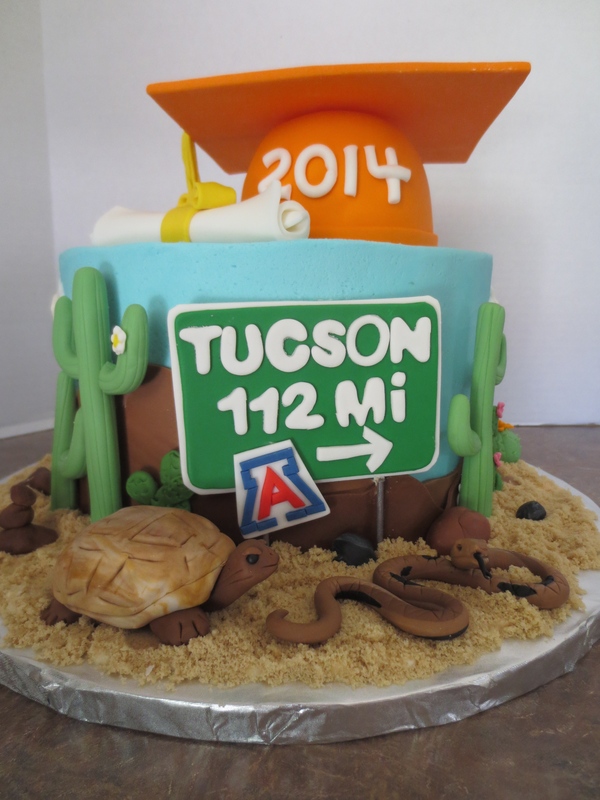 When I sketched out the cake my friend just wanted a couple of things that their son enjoys…desert tortoise, snake, desert stuff, an orange grad cap and a U of Arizona sign somewhere on the cake. The cake was a 9 inch vanilla cake with vanilla buttercream and fondant decor. I actually made red, white and blue filling for the inside of the cake ( U of A colors). All of the decor was made of fondant and the grad cap was rice krispies treats covered in fondant. 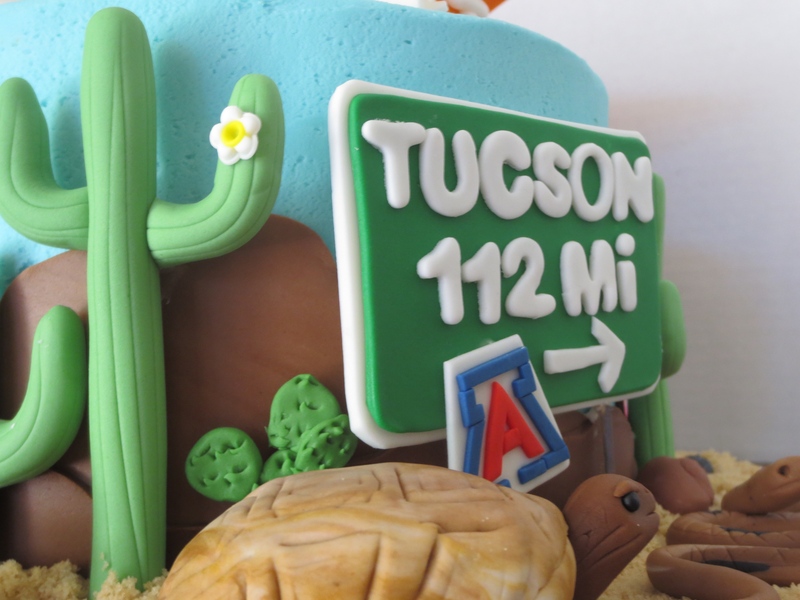 The decor that I made ahead of time were the cacti (saguaro cactus and paddle cactus and round cactus), rocks, animals and the graduation stuff…oh, and the road sign. I also used brown sugar for the desert sand and piped royal icing for the clouds. My friend had said that she was really going to miss her son because they do so much together so I made a road sign that told her how far he was going. 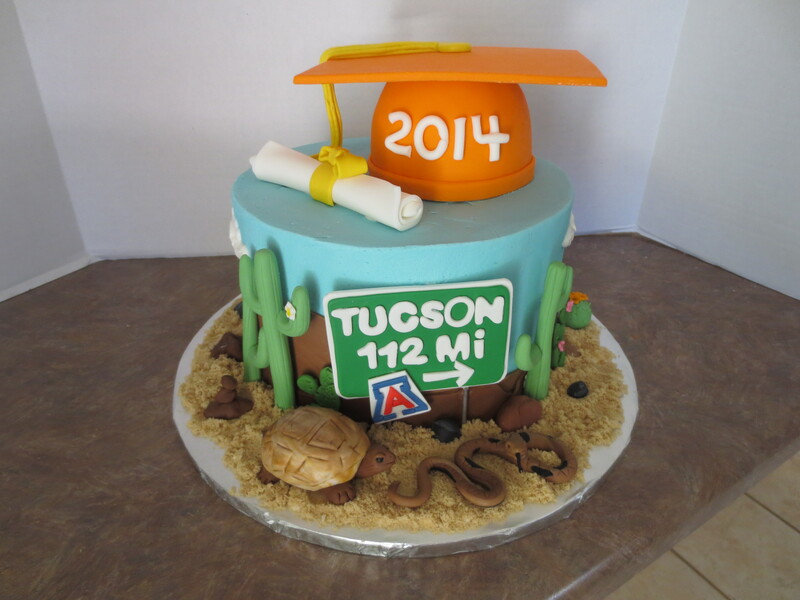 U of A is only 112 miles from Phoenix….THAT’S NOTHIN! Hopefully that made her feel better because that’s a hop, skip and a jump to see her son. 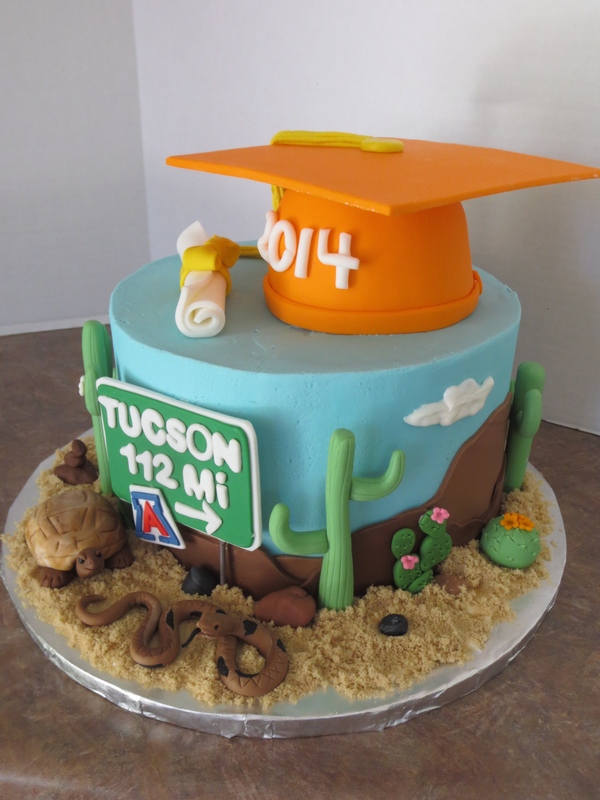 I hope you enjoyed my desert grad cake and I hope this post helps anyone reading it. Have a great week! Just though I’d share this cake with you too. 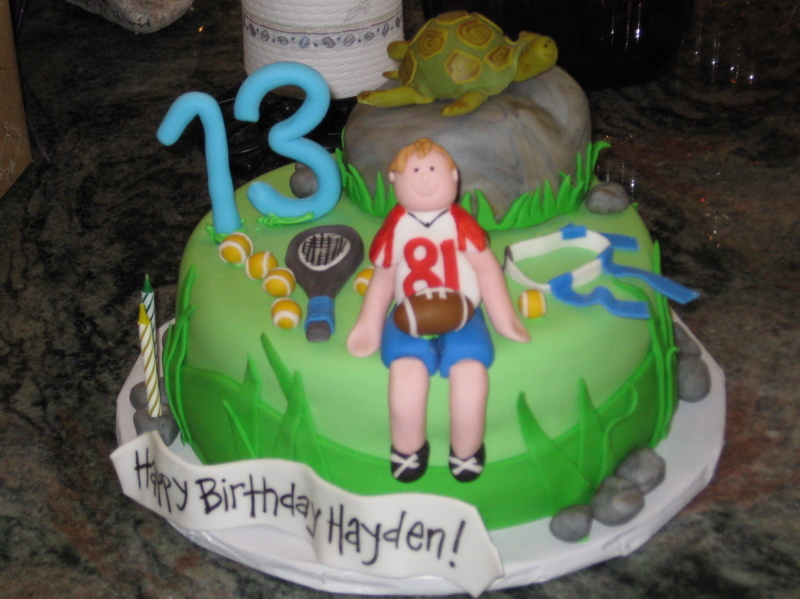 I made this cake for the graduate 5 years ago on his 13th birthday….wow, time flies! He’s such a great kid and I wish him luck at U of Arizona, he’s gonna have a blast.